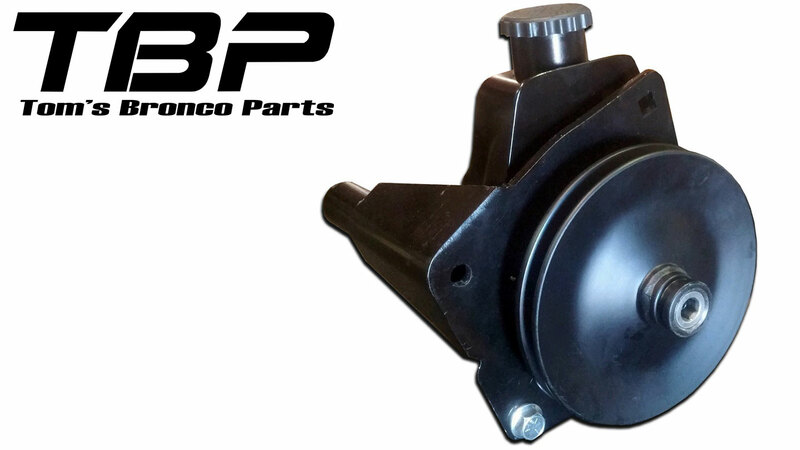 New Power Steering Pump Kit for 66-77 Classic Ford Broncos. Includes Saginaw Style Pump, Pulley, Bracket & Belt. Pump failure sound familiar or just a lot of whining? If so, replace it with a heavy duty Saginaw pump kit. Kit comes with all new parts which include the pump, pulley, mounting bracket and belt. This kit retains the stock Bronco high and low pressure hoses. Fits 289 and 302. My original rebuilt power steering pump worked fine when driving, but the belt would squeal when stopped and trying to turn the wheels. I tightened the belt more than once to no avail. I have 33x12.50 tires BFG All-Terrains. I installed this new Saginaw pump and no more belt squeal. You will have to enlarge the hole on the tension bracket to 7/16ths. You will also have to eliminate the original line cooler, or the pulley alignment will be off.I did reuse my original hoses. Overall a nice kit and addition.